“Beloved Son (or Daughter), as I see you compare your marriage to a woman (or man) marking off time as a prisoner in jail on death row. You grieve me more than you know. You fear breaking your wedding vows, and think divorce is not allowed, but this marriage was not ordained by ME, rather it was ordained by both of thee. You chose this woman (or man) and asked me to bless what I did not join together. It was only a matter of time before you both would regret your choices and realize this illusion of a marriage is like the fate of the titanic boat, it turned out to be another one of satan’s cruel jokes. The world’s interest in the fascinating history of Titanic has endured for almost 100 years. April 15, 2005 will mark the 93rd anniversary of the sinking of the Titanic ship and although it has been nearly a century since the infamous luxury liner sank in the Atlantic Ocean, there continues to be a thirst for information regarding Titanic facts, myths and legends. No other ship in the history of ocean travel has demanded as much interest as the Titanic. Volumes of books and reels of film have been produced regarding the most infamous shipwreck in history. We have attempted to provide here a brief introduction to some of the more fascinating facts, legends and myths regarding the sinking of the ship that was labeled ‘unsinkable’ before her disastrous maiden voyage in April of 1912. Interesting. I didn’t know that YAHWEH or YAHUSHUA would ever make mistake in remembering human history. Something interesting. Today is February 22, 2010 when I was print-screening #111 page. There is no audio for this so-called prophecy. Is there any question mark in your mind, People? 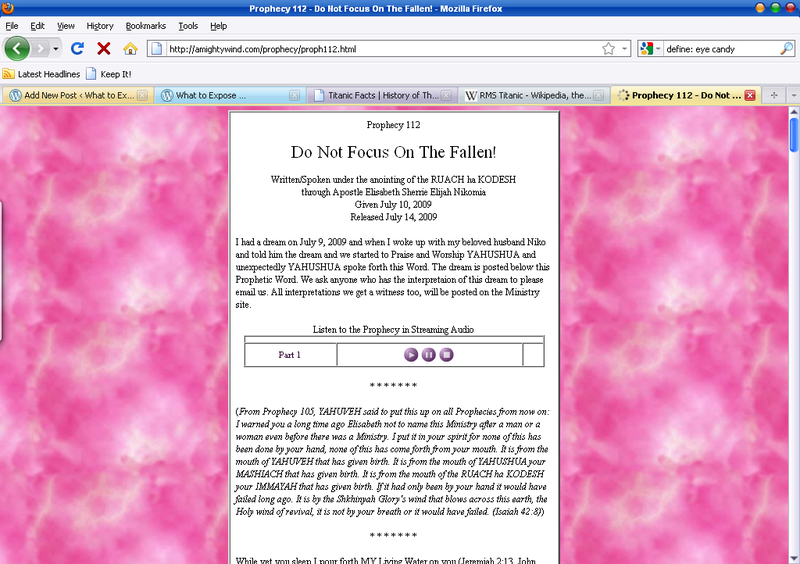 Dear Readers, if you are reading this page, please check the page again at http://amightywind.com/prophecy/proph111.html or its mirror http://almightywind.com/prophecy/proph111.html again. If you find there is still no audio file, save the page or print screen it for your own archive too. At least there will be more witnesses that the so-called Prophecy 111 still has no audio file when you come. I am curious if they will ever upload any audio file. Because if they will, the question will be “when”, “why” and “how” … and “will the word boat suddenly be changed into ship”? Would you still feel curious to read the whole page, People? 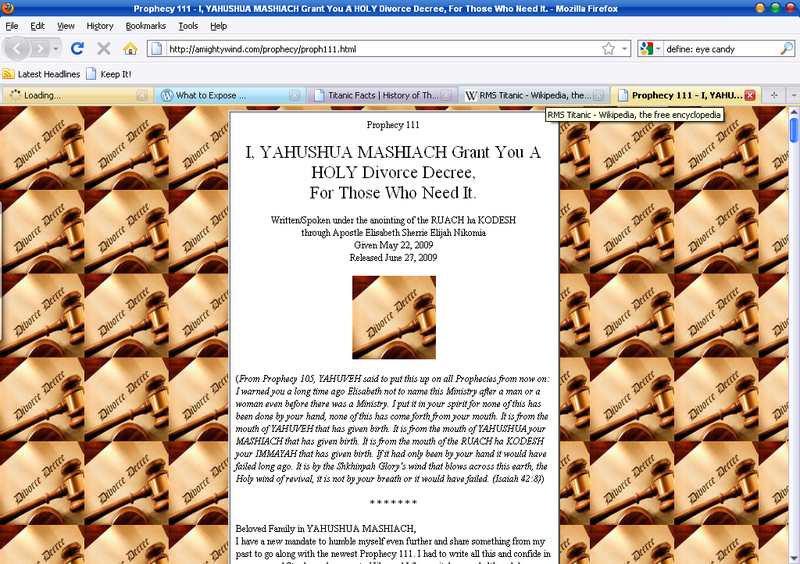 I wonder which YAHWEH (whom they wrote as YAHUVEH) and which YAHUSHUA (aka Jesus Christ) that amightywind.com / almightywind.com are serving right now. Would the real YAH ever make mistake? That website “almightywind.com” reads like a big steamy cup of crazy. Re: the TITANIC “Boat”- Like when the Scriptures say that GOD prepared a great FISH for Jonah. Well, more than likely it was more than just a “FISH”, or even a “great FISH”, it had to had been definitely BIGGER than a fish. So, was GOD wrong in the Scriptures about using THAT word, too? 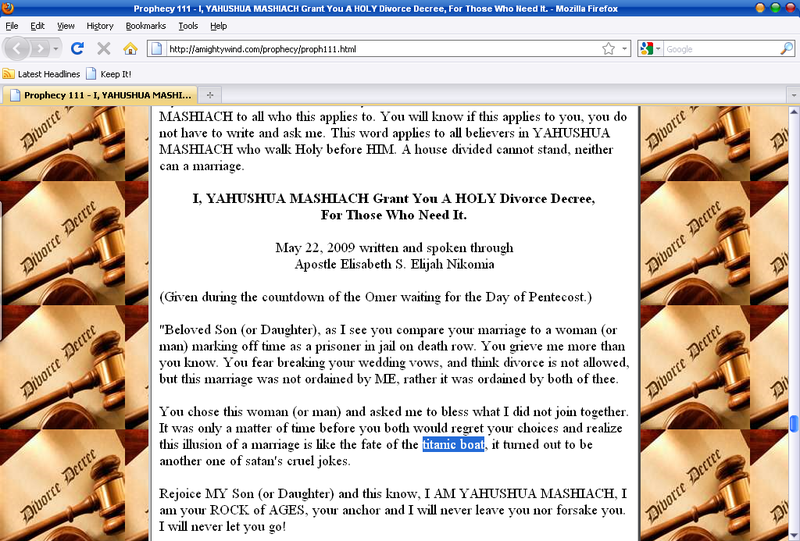 Re: Divorce…Remember what is said during the Wedding Ceremonies by the Pastors, etc…? “What GOD hath joined together, let no man put asunder.” And, how many Christians are marrying people that GOD never ordained for them? Howe many Christians are marrying someone out of the desires of their flesh, rather than seeking the LORD’s Face to find out who HE has in Mind for them? When two people truly marry in the LORD, let them never get a Divorce. GOD does hate Divorce, esp. when it occurs among HIS PEOPLE! He hates it when unsaved people divorce, but, HE expects HIS people NOT TO BE UNEQUALLY YOKED! Do not, as a Christian, marry someone who is not a Christian also, and who GOD has not prepared for you, after you have ASKED HIM for a mate! I do hope that you will post my messages, for, you see, if you are so certain that AMIGHTYWIND is a false ministry, then, anything I have to say should not be a threat to you and others. Let the people decide, as well….If you only post messages from people that agree with you, you are doing no one any justice. Like YAHUSHUA said, “If you only love those who love you, what reward is there for that? For even the sinners do that much. Rather, love your ENEMIES also, and then your Father in Heaven will reward you, etc…The principle is the same here with the posting of messages that both argue FOR and AGAINST the AMIGHTYWIND Ministry. If what I have to say, as it gets posted, is “false”, then it will not be able to stand against the opposition. WISDOM is justified by Her children. How about…..GET A LIFE!!! Make yourself useful like win souls to Jesus Christ instead OF wasting time promoting gossip, backbiting, and slander on someone or a ministry you don’t know. If you have a problem OR are in doubt on whatever the message is being presented…..DO THE RIGHT THING AND ASK THE PASTOR YOURSELF. Don’t argue, don’t debate, no name calling…..just ask and do it in the most Christ honoring, brotherly lovingly way. THE WAY CHRISTIANS ARE SUPPOSE TO BEHAVE.